there is adequate blood flow going to the deep part of the muscle which is generally where the worst part of the strain is. Ideally, THE STRETCH SHOULD BE DONE WITHIN 5 MINUTES AFTER EXERCISE OR ACTIVITY. Even 5-10 minutes of steady activity around the house or office will help warm up the muscle so that you can get the maximum benefit of the stretch to the deep part of the muscle before it has a chance to cool down. This will insure that as the muscle cools down it doesn’t keep returning to the same set point over and over. It is ok to stretch before getting out of bed in the morning. This is a great way to loosen up and get the day started but it is not as effective for re-educating muscles as doing it after activity. Directions: Sit up straight and anchor your right shoulder down by holding onto the chair with the right arm. 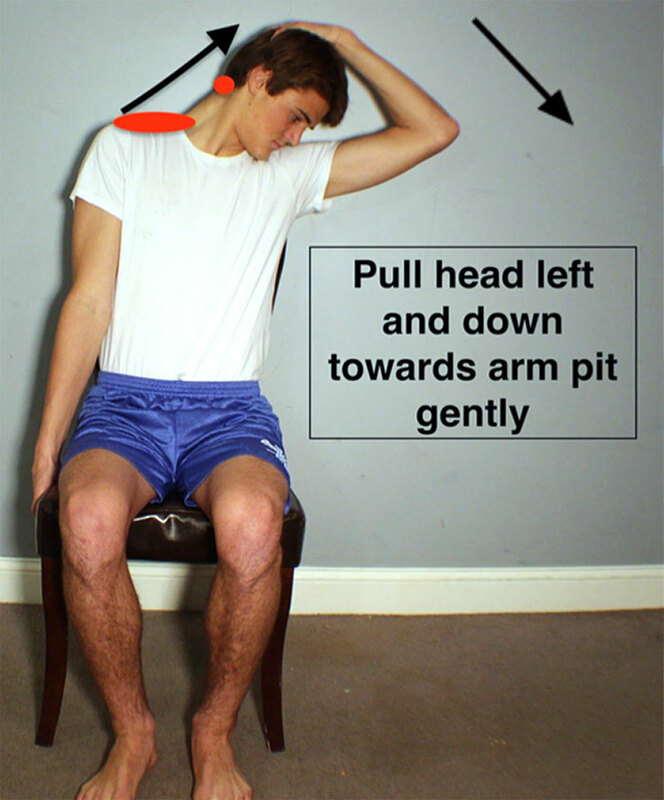 Turn your head as far as is comfortable towards your left shoulder and with 1-2 pounds of force GENTLY pull your left arm down towards the floor until you feel tension and stretching on the right side of the neck and upper shoulder. Ideally, you will also get some pull into the base of the skull on the right which is where most muscle tension headaches come from. When starting out DO NOT OVER STRETCH THIS AREA as it can be quite sensitive until your body gets used to it. It is important to go just to the first place you start to feel the pull and hold it there. A good rule of thumb in the first week of stretching this one is to initially go to where it feels like the right amount of pull and then back off 20%. Many people do this one after putting a heating pad around the neck for 10-15 minutes.